Is it a bike? Is it a car? It’s a TourOz. It costs $50,000 and you sit on it, not in it. I put to its owner, Chris Pusey, from Bundaberg: for 50 grand you could get a car, couldn’t you? Geoff and Kathy Shew from Kalgoorlie have a TourOz with a turbo charger which drives its price to $55,000. Is it a converted Harley, I ask innocently. What about in a corner, being a three wheeler? How fast do you go? He’s had it up to 150 km/h with a trailer on – not on a public road, of course! Geoff: “How long’s a piece of string? I don’t know whether your cousin or brother or someone you know is a policeman.” All laugh. These four visitors to Alice have at least two things in common with the other 2500 campers on Blatherskite Park: they are over 40 and love bikes. They’re in town for the week-long Ulysses AGM. From the show grounds, access to which is tightly controlled, they spill over into the Mall. Yesterday every table except one in an outdoor eatery was occupied by Ulysses members, swapping yarns about the trip to The Centre, thousands of kilometres for most of them. Today and tomorrow they will fan out into the East and West MacDonnells and many will call in at The Rock on the way home. 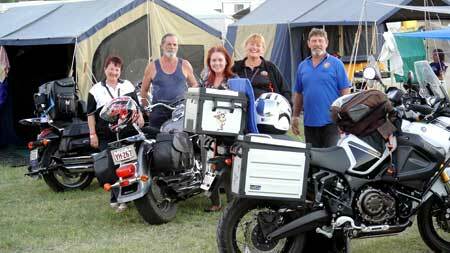 Dianne Reily, Ian Lawley, Tracey Reid, Annette McDougall, and John Reid rode from Queensland. But that’s what the other guy just said. The variety, standard and value of the equipment are staggering: gleaming bikes, many towing sophisticated camper trailers, standard caravans and motor homes side by side, with the yarns flying thick and strong. What do you like best about it? “Everything.” Tracey points at the setting sun, turning the hills to the south a vivid orange. Not so good is the smell from the sewage plant just across the fence. The view is great but the smell is not: that’s how the 2014 Ulysses AGM will be remembered, she says. Dianne has all her gear strapped to her bike – no trailer. Same with Annette, who is on a 800cc Suzuki. The two women ride together and usually overnight at a camping ground. Has she ever dropped her bike? Why doesn’t she ride pillion with partner John? How can you avoid getting a sore bum? It seems partners Ian and Annette don’t get to spend much time together on these trips. Ian tows a trailer behind his 1500cc Suzuki Boulevard which carries – amongst other gear – a swag, esky and a 3m by 6m tent. The trailer top converts into a queen size bed. 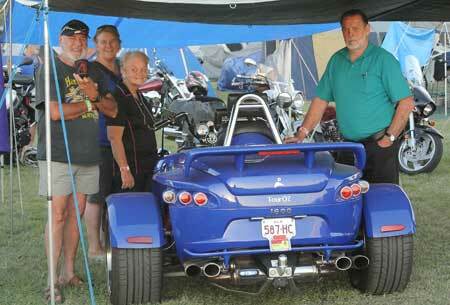 Pictured, top right: Dianne Reily, Ian Lawley, Tracey Reid, Annette McDougall, John Reid, all from Queensland; above left: Sheryl and Chris Pusey (Bundaberg) and Geoff and Kathy Shew (Kalgoorlie) with a TourOz trike. Should’ve come during the Finke week and put the fear of God into those lawless nutters that prance about in their 4x4s.